Andy Murray will play at the ATP World Tour Finals in November after securing his place at the season-ending event by reaching the US Open semi-finals. The British number one, 25, beat Marin Cilic 3-6 7-6 (7-4) 6-2 6-0 on Wednesday to reach the last four. That guarantees his place in the world's top-eight and consequently the ATP World Tour Finals. 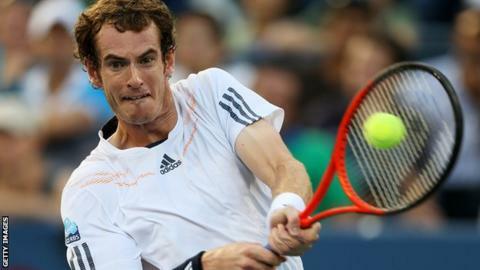 The event, held from 5-12 November, will mark a return to London for Murray after winning Olympic gold last month. "It's great to have qualified again for London," said Murray. "I've played some of my best tennis this year on home soil, so hopefully I can also have a good run at The O2 in November. "The atmosphere and the support I've had there has always been incredible." Murray is the fourth singles player to qualify for the ATP World Tour Finals, joining Novak Djokovic, Roger Federer and Rafael Nadal in the field. Four singles places are still available with the likes of Jo-Wilfried Tsonga, David Ferrer, Juan Martin Del Potro and Tomas Berdych all in contention.